I secured my Headship in June 2016, for a brand new secondary school that was still being built in Didcot. The new school, commissioned by Oxfordshire County Council, was being built in response to the rapid expansion of new houses and the knock on need for school places. The Great Western Park is the largest housing project in Europe. Positioned in the middle of two major science parks, it is anticipated that there will be 15,000 more STEM roles over the next five years. It thus made sense for the school to be designated as a STEM school. However, as an English, Media and Drama specialist who has led the Performing Arts provision in the last few London schools I have worked in, I felt very strongly that I did not want our vision to result in an unbalanced curriculum and focus on some subjects at the expense of others. I thus re-designated us as a STEAM School. I use the phrase of putting the ‘Arts at the Heart’ of our school. As a values-led school delivering a values-based education, the staff explored our shared vision and values to create our values wheel. 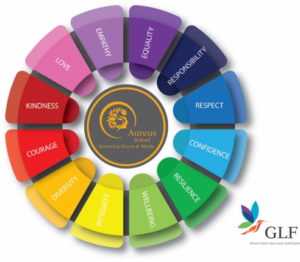 Our values underpin everything we do at Aureus School. We see our values as our DNA. The values of Diversity and Equality are particularly important to us. As well as being a Headteacher I am the co-founder of a grassroots gender equality movement: #WomenEd. As a school we are striving to challenge and subvert gender stereotypes. Moreover, the success of #WomenEd has led to the birth of #BAMEed, a similar grassroots movement striving to inspire and empower educators and leaders from diverse backgrounds to progress into leadership roles. We triangulate our discussions about diversity, equality and STEAM as we know there is a lack of diverse representation in science, maths and technology. At Aureus School there is no glass ceiling, we are raising the aspirations of all of our students to aspire to employment in the STEAM industries. Our team understand and embrace the benefits to children and young people of having a mix of STEAM skills and the importance of a broad education that gives parity to science, technology, engineering, arts and maths subjects. We are committed to our students needing #STEAMskills to reach their potential and are passionate about STEAM being essential for creating a workforce that solves the problems of the future. STEAM Team – our Assistant Headteacher who leads our specialism line manages our Science, Maths, Computing and Arts staff so that he had oversight over the curriculum, cross-curricular links and extra-curricular opportunities. STEAM Careers Assemblies - we invite regional STEAM ambassadors in to share their career expertise and experiences with our students to demystify some of the roles that exist that they may not understand or be aware of. STEAM Library – we have a designated section for books with positive role models show casing diverse people breaking the mould. All of our Year 7s were given a reading book to read over the summer as part of their transition project, we carefully shortlisted books with strong female protagonists that explored STEAM themes. This summer all of our students and staff read The Case of the Missing Moonstone by Jordan Stratford. STEAM Days - we have planned a termly drop down day where artists and scientists come in and work on projects with our students so that they can apply their cross-curricular STEAM skills to real life projects. Our first one, last week, was themed as ‘breaking the code’ and built on the knowledge that they had gained about Ada Lovelace, introduced Rosalind Franklin and involved them coding, dancing and building their own hot air balloons. STEAM Partnerships - in December we are hosting our first STEAM roundtable curated by Steph Green of Dauntless Daughters, which will lead into our inaugural STEAM #teachmeet that night. STEAM Collaborations – we are delighted to be the home of The Didcot Art Room; this national charity is very much aligned with our vision for the arts, and this therapeutic service is benefitting our students and those in our feeders. We have also extended office and events space to the Winchester Science Centre who have a network of over 1,000 STEM ambassadors across the county and are currently housing the cast from the Cornerstone’s Christmas production of the Nutcracker. STEAM Projects – our next steps over the coming year include community art commissions, an Artist in Residence, a Maths Hub partnerships, a LEGO play therapy room, an event with STEAMCo and introducing student STEAM Ambassadors to go out into our community to work with our primary feeders and regional organisations. We have not yet been open a term - our official opening is on our 100th day on 11th December but we feel that we have a strong vision for the STEAM provision we will curate at Aureus School. The cross-sector opportunities and national partnerships are going to lead to some really exciting collaborations which will open doors for our students in the future. By nurturing the hearts and the minds of our young people we will work together to ensure that they will all grow, learn and flourish to live our values and develop the STEAM skills to ensure that they are highly employable graduates of the future. 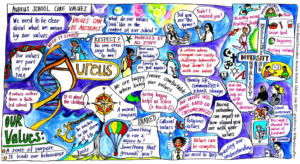 Follow us on our #STEAM journey @AureusSchool on Twitter, @Aureus_School on Instagram and www.aureusschool.org. 2 Replies to "Developing a STEAM school"
Hanah, her school and her approach leadership are an inspiration! Dauntless Daughters are really grateful for that insliration and amazing support. Great to see a whole school approach to STEAM, and hopefully this model proves successful!